"Death returns, and its name is…" Dark Sky Films has released the final, full official trailer for the horror sequel Victor Crowley, the 4th film in the Hatchet horror series. Creator Adam Green returns to write & direct this film, which has been described as "smartly written, outrageously funny, and incredibly gory." Horror fans may remember that this film was a big surprise last fall, as no one knew it was even being made and suddenly they had announced with a touring road show. Set a decade after the events of the first three films, the story follows the one-and-only survivor who has been trying to get people to believe his story for years. He ends up back at the place where it all started, and Crowley is resurrected. Starring Kane Hodder and Parry Shen, with Laura Ortiz, Dave Sheridan, and Brian Quinn. Only for die-hard horror fans. You can still watch the teaser trailer for Victor Crowley from last year here, to see a bit more footage. In 2007, forty-nine people were brutally torn to pieces in Louisiana’s Honey Island Swamp. Over the past decade, lone survivor Andrew Yong’s claims that local legend Victor Crowley was responsible for the horrific massacre have been met with great controversy, but when a twist of fate puts him back at the scene of the tragedy, Crowley is mistakenly resurrected and Yong must face the bloodthirsty ghost from his past. 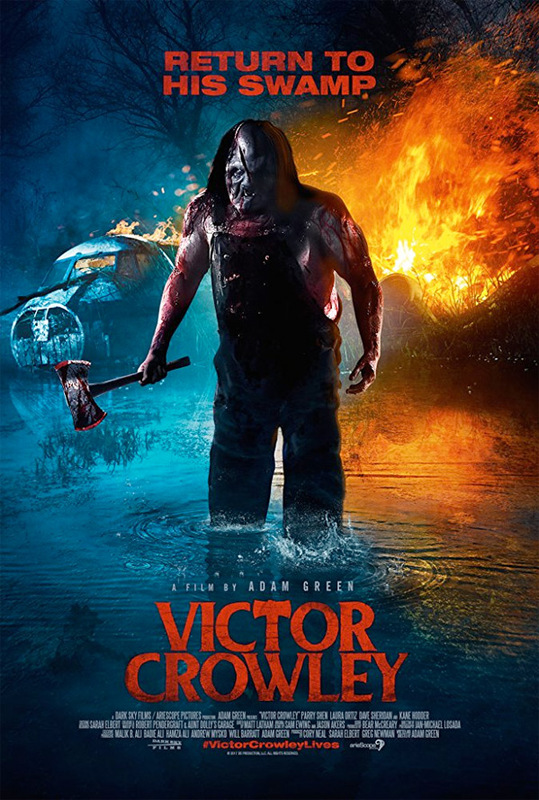 Victor Crowley is once again written and directed by American filmmaker Adam Green, of the films Hatchet I & II, Digging Up the Marrow, Spiral, and Frozen; as well as episodes of "Holliston" and "Horrified". This was made independently by Adam Green and ArieScope Pictures. Dark Sky Films first released Victor Crowley in theaters last year as part of a touring "Victor Crowley Road Show." They will now be releasing the horror film direct-to-VOD/DVD starting on February 6th next month. Anyone curious?